I ran into a friend of mine yesterday in Hobby Lobby and she asked me “Hey, which punch is it I need to make those flowers?” Er . . . ah . . . I guess I forgot to to tell you . . . you don’t actually have to have that punch. Now that punch makes a cute flower, but really, any border punch that completely separates away from the paper will do. In other words, a self contained border – one that does not stay attached to the page. So this morning I decided to show you what I meant. I picked out four different punches, punched one strip, gathered (just like I show in my Ruffled Flower Tutorial) and it makes a quick and cute flower. 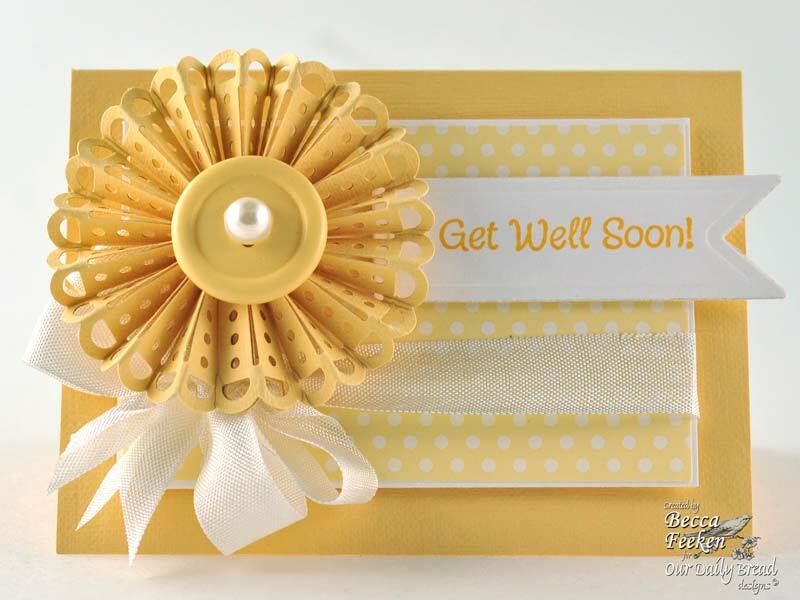 Plunk down a button or something on top and you have a quick embellishment for your card. By the way, I’m sneak peeking here too!! These sentiments are all new releases that will be coming out with Our Daily Bread Designs tomorrow. You can see them in a blog hop bright and early tomorrow morning! There are all 4 1/2 inches wide and 3 1/4 inches tall. Perfect for oversized enclosure cards or a sweet treat to include in the box for a friend. Thanks for stopping by today. I’ll see you tomorrow for the ODBD Blog Hop!! Becca…love, love, love these. The colors..the punched flowers- gorgeous! These are so cute, Becca. Love how each one makes them look different! Somebody else probably already asked, but can you show each of the punched paper before you start folding?? Just gorgeous Becca and thanks so much. Will have a hunt through my punches. Another great and clever idea from you and thanks for sharing with us. These are stunning Becca and I love all the pretty pastels. Each flower looks gorgeous. Stunning set! Love all the colors and the new sentiments are so beautiful. Hope you are enjoying and amazing weekend. Hi Becca. In your tutorial you did mention that the punch you used was the Chinese Knot punch and it’s by EK Success. I love all the flowers you created with the various edge punches; so very clever and beautiful. Sooo pretty! I love all your examples. oh wow Becca I’m in love with these. Stunning!!! Love the different punches you used! Oooooh – these cards are so pretty. Thanks for expanding our horizons yet again! Wow, wow,wow!!! Aren’t you just the smartest little crafter ever. You come up with some of the neatest ideas. I would love to come and hang out with you in your studio sometime:) Oh well it was a great thought and since I live a long way from where you do, I will just have to keep depending on you to keep the great cards and ideas coming. your cards all look beautiful. great colors you have chosen you. I’m just wondering, can you send the cards to the post? I am delighted to know you can use any of these punches as I could not find the one you referred to…LOL! So I bought the MS double-edge punch called bangle chain trim…going to give that a try! Thanks for the forgotten information…makes me feel soooooooo much better! Terrific projects as usual Becca. can you use other punches besides EK Success like MS? 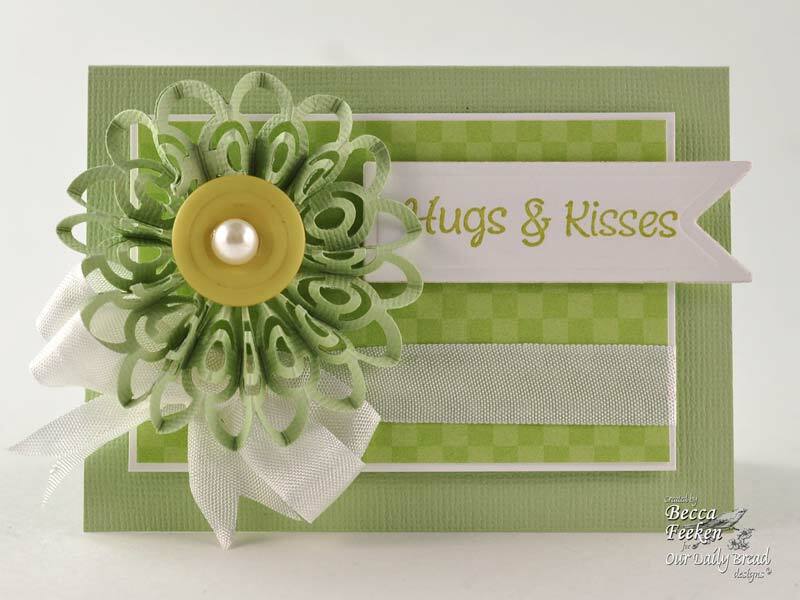 I love all of these ruffled flowers, a beautiful embellishment for a card or box. Thank you for sharing with us yet again! “Simply” but o so beautiful!! thanks Becca, as usual an absolutley beautiful card and tutorial, great to have in your box of tricks. Each punch gives a slightly different look, yet they all look fabulous! Love your color schemes. A nice pretty, relatively quick and simple card, but it looks great! can you double check the names of these punches and list them with color card you made, so far I have only been able to find diamond fence(which doesn’t look like the right punch for this job) and the Bangle chain…which I am getting. No one knows the name of the yellow one at all and even on the martha stewart site there is no punch called “linked”. 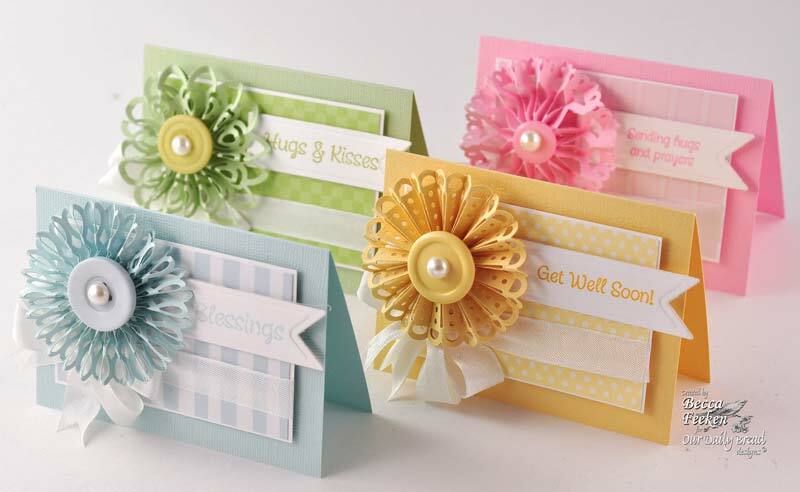 Love your little cards, can also use them to make table-cards. Sweet little cards ! Love them ! Thanks fot sharing them ! You surely are the most talented cardmaker out there, i have stalked your blog for ages and i just wanted to thank you for always sharing your amazing taletn with all of us humble wannabees. You surely are the most talented cardmaker out there, i have stalked your blog for ages and i just wanted to thank you for always sharing your amazing talent with all of us humble wannabees.